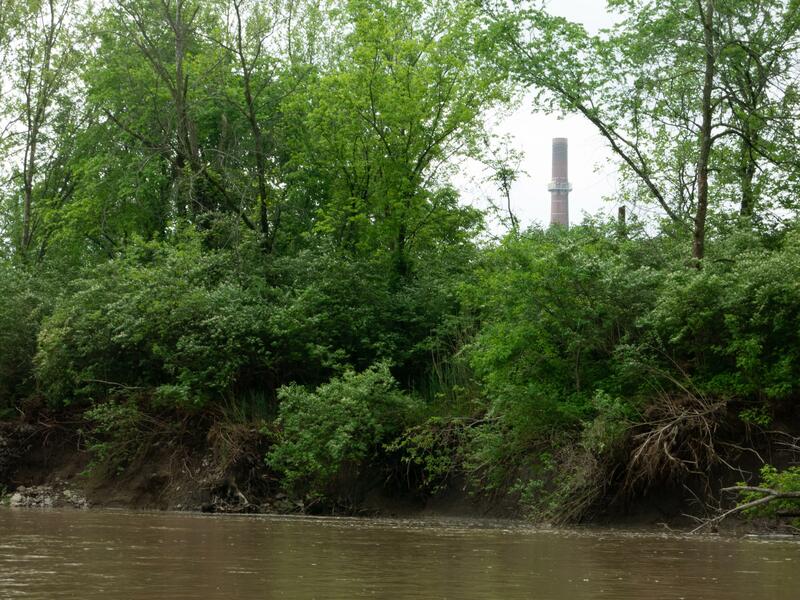 The smokestack of Dynegy's shuttered Vermilion Power Station still towers over the Middle Fork River. State and federal agencies will soon decide whether to allow the company to wall off a long stretch of the river to protect its coal ash ponds from ongoing erosion. 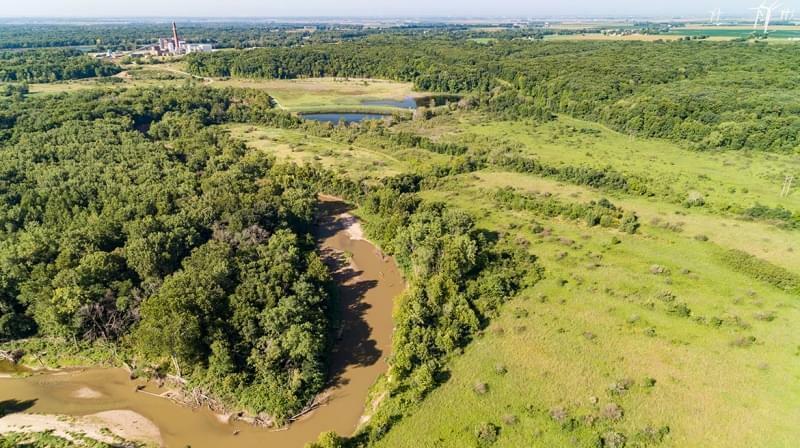 The Illinois Environmental Agency will hold a public hearing Tuesday, March 26, 2019 to take comments on a proposal by Dynegy Midwest Generation to construct a wall of rock along the Middle Fork River near the company’s coal ash ponds at the Vermilion Power Station near Danville. The meeting will be held at Danville Area Community College’s Mary Miller Gymnasium Tuesday beginning at 6:00 pm. Attendance and testimony is open to anyone interested in speaking to the IEPA about the Dynegy proposal. Community and environmental groups are also planning a rally outside the building at 5:30 pm. 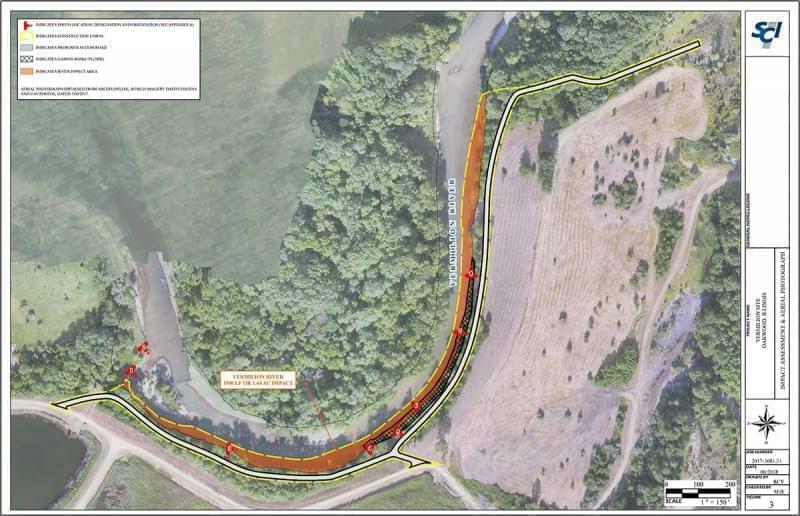 Dynegy is seeking approval for construction of a 2000-foot-long rock wall along the river to stop erosion that's cutting into the riverbank near its three coal ash ponds. Opponents want Dynegy to move the coal ash instead. The ash ponds are just upstream of Kickapoo State Park, a recreational site enjoyed by more than a million visitors each year. The ponds are 40 feet deep and contain 3.3 million cubic yards of toxic coal ash. They were built without liners that would protect groundwater, and placed just yards from the Middle Fork and within the river’s floodplain. Coal ash contains a toxic mix of chemicals and heavy metals including arsenic, lead, mercury, boron, chlorine, and selenium. Dynegy’s tests show the coal ash is polluting groundwater in excess of state and federal water quality standards. Contaminants are also seeping into the Middle Fork through the riverbank near the ash ponds. The IEPA issued a violation notice to Dynegy in 2012 for polluting the groundwater, and another in 2018 for contamination of the Middle Fork River. So far Dynegy has not been penalized for either violation, but last week the IEPA referred the matter to the Illinois Attorney General for enforcement. 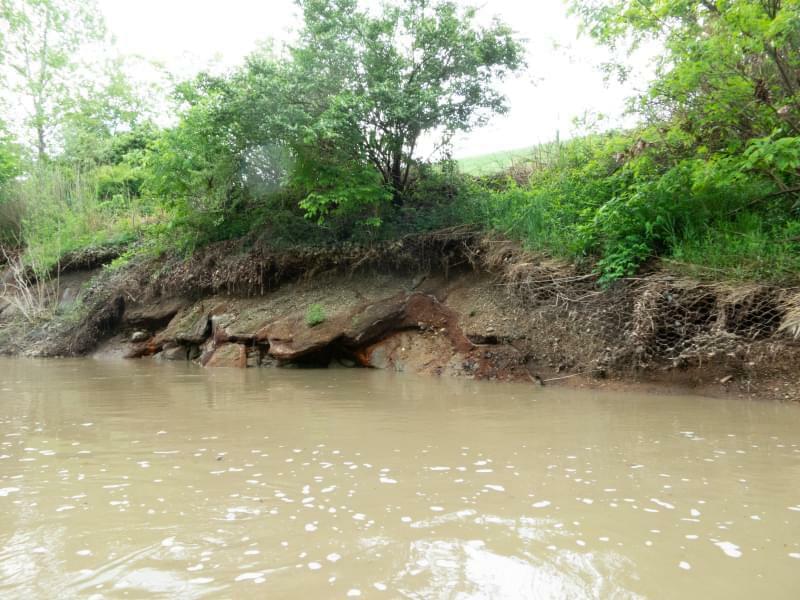 The referral asks the Illinois AG to direct Dynegy to implement a closure plan for the ash ponds that meets water quality standards, stabilize the riverbank, and pay a fine for the violations. Contaminants can be seen leaching into the Middle Fork through several seeps in the riverbank by Dynegy's coal ash ponds. In addition to ongoing contamination, the site has a history of dangerous riverbank erosion that could potentially breach the ash ponds and cause a spill of up to 600 million gallons of coal ash into the Middle Fork River. 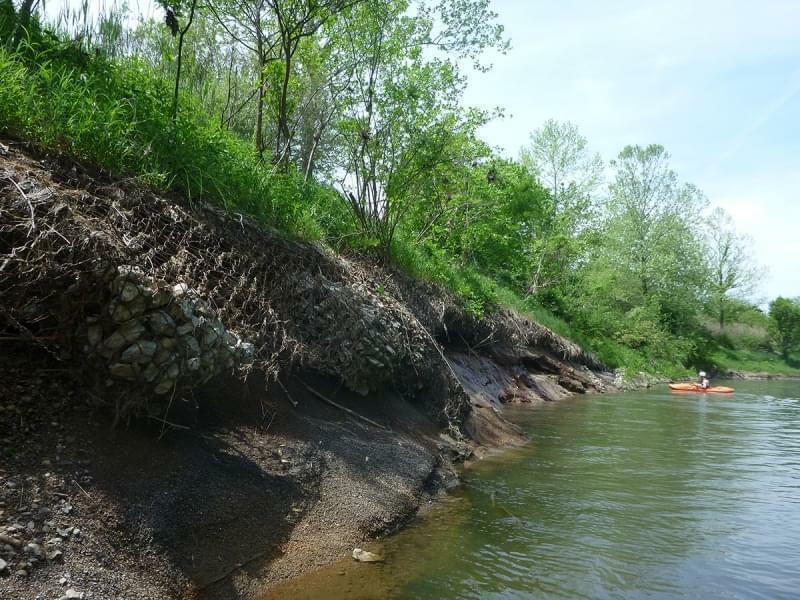 Dynegy has made attempts to armor the riverbanks with steel gabions but the river washed them downstream. If there’s anything all concerned can agree on, it’s that the riverbank must be stabilized soon. Opponents of the plan include area officials, residents, business groups, and environmentalists. A resolution passed last year by the Vermilion County Board said construction of the rock wall would damage the scenic value and recreational use of the Middle Fork, and that based on the history of the river any stabilization would eventually fail. "While the coal ash remains in place, any solution for bank armoring is temporary and allows for further degradation of the river,” the resolution said. “The only permanent solution to protect the Middle Fork from coal ash pollution is the complete removal of coal ash from the floodplain." 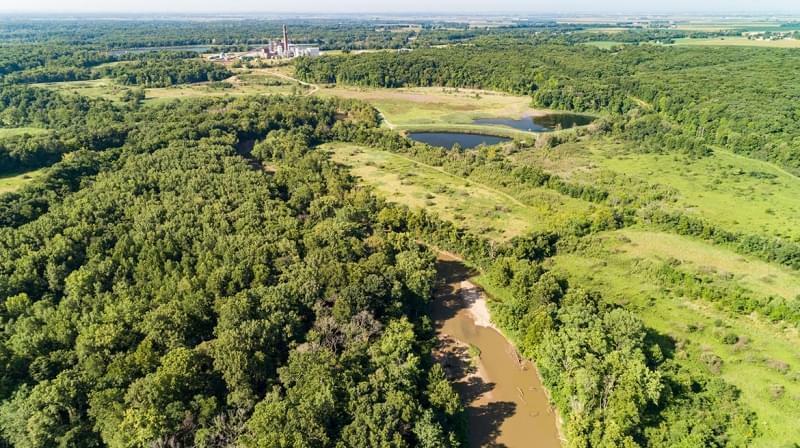 Andrew Rehn, a water resources engineer with the Champaign-based environmental group Prairie Rivers Network, says the proposed stabilization plan should be scaled back. "Dynegy is looking to put in a massive amount of bank armoring that's going to encroach on the river quite significantly, dig into the bottom of the river, and potentially stir up a lot of sediment that has thus far had coal ash seepage seeping through it for a very very long time," he said. "We think a limited project that's removable would be preferable to a large scale project." A diagram in Dynegy's permit application shows the location of the proposed riverbank stabilization project next to its three coal ash ponds. The company would excavate the Middle Fork to a depth of seven feet, and construct a wall with more than 24,000 cubic yards of rock and boulders for more than a third of a mile along the river. The permitting process started last summer when Dynegy filed an application for construction to stabilize the riverbank. If approved, the company would excavate the riverbed to a depth of seven feet, and install 22,240 cubic yards of fill material and 2,130 cubic yards of large stone boulders along more than a third of a mile of the river. Dynegy is applying for what’s called as a joint 401/404 permit application, based on criteria in Sections 401 and 404 of the federal Clean Water Act. Permit applications for projects of this size in a National Scenic River are reviewed by five different state and federal agencies. The U.S. Army Corps of Engineers manages the overall permit application review by all the agencies, following a permitting process in Section 404 of the federal Clean Water Act and a public interest evaluation. If the proposed project could result in a discharge of pollutants, it must also receive a water quality certification under Section 401 of the Clean Water Act. 401 permits are administered by state authorities, and in Illinois that’s the IEPA. Tuesday’s public hearing is part of IEPA’s evaluation of the project for an Illinois 401 water quality certification. The Illinois EPA has given tentative approval to Dynegy's permit application based on information provided by the company. After reviewing the permit application and getting public input, the IEPA will either approve or deny a 401 certification. If the IEPA approves the certification, the application returns to the U.S. Army Corps of Engineers for further review. Several other state and federal agencies must also review the application based on their own requirements: The Illinois Department of Natural Resources, The U.S. Fish and Wildlife Service, and the National Park Service. Sarah Keller, the U.S. Army Corps of Engineers project manager for the permit, will approve or reject Dynegy’s application at the end of the review process. She said she can’t authorize the Section 404 permit until she has clearance from all the agencies. The Middle Fork River is Illinois' only National Scenic River, and is a favorite of canoeists and kayakers. 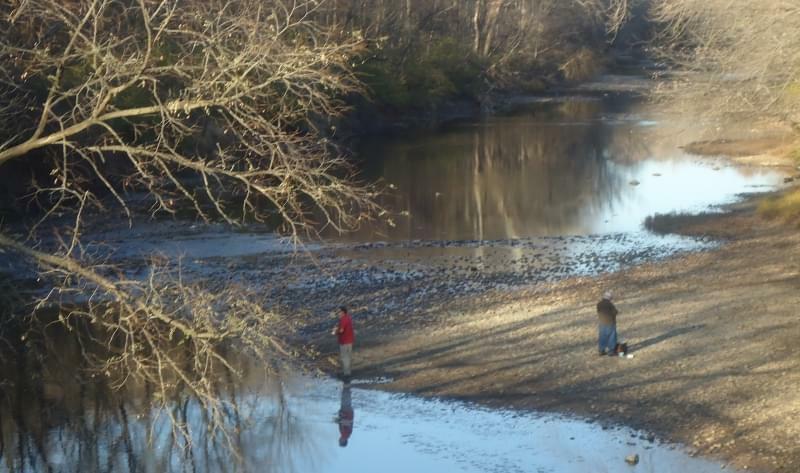 The river flows through Kickapoo State Park, a recreation area visited by more than a million people each year. Downstream it joins the Vermilion River, which flows through downtown Danville. Sarah Keller at the U.S. Army Corps of Engineers said she initially viewed Dynegy’s proposal as likely causing only minimal environmental impact, and was ready to process the application under a “general permit” which doesn’t require extensive review of the site. After hearing the public concerns, the Corps determined it was prudent to review Dynegy’s application under a standard permit requiring more review of the site – and the issuance of a public notice for comment. The "Our public notice process is independent of all the other regulatory agencies decision processes," Keller said. Corps’ public notice was posted on November 26, 2018, and its public comment period ended on January 10, 2019. Keller said the permitting process at the Corps depends on getting full information about the site, and public involvement is essential. The National Park Service must determine if Dynegy’s proposal would have a “direct and adverse impact” on the Middle Fork as a National Scenic River. The U.S. Army Corps of Engineers evaluates the application based on “public interest factors,” such as navigation, general environmental concerns, wetlands, economics, fish and wildlife values, land use, floodplain values, and the needs and welfare of the public. But the IEPA can deny Dynegy’s Section 401 permit application only if the project would result in discharge of pollutants that violate state and federal water quality standards or interfere with existing recreational uses of the river. Sofat said the IEPA will only consider public comments that address these requirements. A fact sheet published by the IEPA provides details on what kind of comments the IEPA, by law, can consider. Public comments on general environmental or coal ash issues, or the future closure of Dynegy’s coal ash ponds, or any other matters that don’t pertain to the potential impact of the project on water quality or recreational use of the Middle Fork, won’t be accepted. And due to the expected public turnout, comments will be limited to two minutes. For anyone who wants to speak at the meeting, "my only message would be that please review the fact sheet carefully, and please comment on what we have concluded in the fact sheet," Sofat said, “because that is where they can help us."